Although the Society was unaware of what existed within the false moon Salvation’s End when it obtained exploration rights, Starfinders have since identified a vast, uncharted megacomplex within. The Society’s ready to launch its first major expedition into the interior, yet there is one slight complication: in order to fund its initial survey missions, the Society accepted a grant that requires this first mission be televised by an Eoxian reality show. What is already be a momentous mission for the Society is only exacerbated by the mandatory presence of an unliving camera crew—not to mention the interference of the live studio audience in orbit! Can the PCs uncover the secrets of Salvation’s End while upholding the Society’s publicity deal (perhaps becoming celebrities in the process)? Content in Live Exploration Extreme! 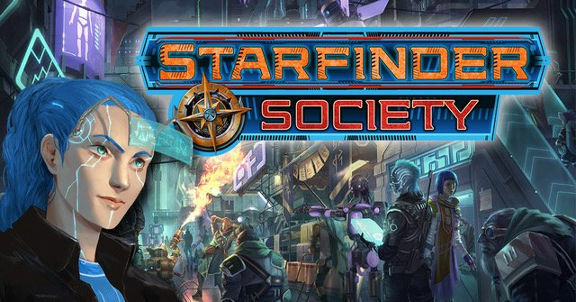 is a continuation of the Starfinder Society special, Starfinder Society #1–00: Claim to Salvation which was run at FG Con 11- but you are not required to have played 1-00. Pregens will be provided but Starfinder Society legal characters are welcome. Starfinder Society Numbers will be provided for those that do not yet have one although registering for a Society number in advance of the Con is encouraged. This will be a Starfinder Society legal table for reporting purposes (if that doesnt mean anything to you, no worries, you can still play!) My Discord alias is Talen. Participation on the Discord channel will be required (Channel “Starfinder: GM Talen”. Time Zones 1300-1800 GMT/UTC or 9am-2pm EST on Saturday April 14th. Are we all starting with lvl 1 characters? Have any characters been submitted to you yet? Do we have any specific holes that need to be filled? No other players have indicated what they are playing yet so all options are on the table for you – play whatever you are interested in! Looking forward to the game! Drat, too late to sign up. Is there any chance of a waiting list? I’ll come along on a melee mystic with the healer connection. Awesome, looks like we’ll have a balanced team going. I’m bringing an Operative, got our “infiltration” skills covered. Every confirmed player should have received an email from me with the FG server and Discord channel info. If you did not receive an email from me, please respond here and I will correct the situation. For reasons that will become clear at the start, if you have run #1–05: The First Mandate or #1–00: Claim to Salvation, you should slot the High Society Influence (Zo!) social boon the Claimant to Salvation boon. Gametime starts in ONE Hour all! I have reported the game and sent out the chronicles. If you find any mistakes, let me know and I will correct them. Thank you for a fun game.